This is a BIG weekend for the BOB Series' pullers and fans! We are at Danville, Kentucky Friday and Saturday! 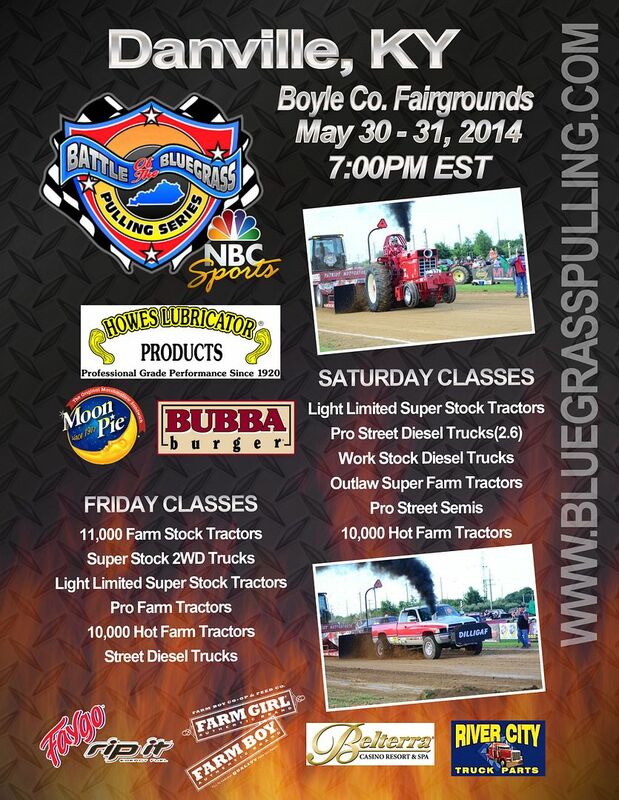 NBC Sports Network will be filming the BOB Series pull in Danville, during the Danville-Boyle County Fair on Saturday. Fan are encouraged to come out and see motorsports broadcasting legend, Bret Kepner, who will be one of the talents during the filming of the NBC Sports show. He was the voice of IHRA Drag Racing for over 25 years and an ESPN commentator for motorsports for 30 years. Friday night classes include the Light Limited Super Stock Tractors, 11,000 Farm Stock Tractors, Super Stock 2WD Trucks, Hot Farm Tractors and the Pro Farm Tractors. Street Diesel has been added to Friday night! Classes to run Saturday night during the NBC Sports Coverage will include Light Limited Super Stock Tractors, Pro Street Diesel Trucks, Work Stock Diesel Trucks, Outlaw Super Stock Tractors, Hot Farm Tractors, Modified 4WD Trucks and Pro Street Semis. Pull start at 7pm each night. Admission to the fair is $10, which lets you into the pull and allows you to ride amusement rides for free. For pull order, Winner Circle pics, and updates, "like" us on Facebook (click here). For rules, series info, press releases, and more, check out our website (click here). The event is sponsored nationally by Howes Lubricator, MoonPie, BUBBA burger, Farm Boy Brand, and Belterra Casino Resort.